A policemen sprayed with shrapnel, a young man from America with a paintball pellet jammed into his eye, a 15-year-old Jordanian boy, born with a genetic eye disorder that leads to blindness, and a seven-year-old with a malignant tumor growing behind her eye socket were among the 45,000 patients that the Hadassah Medical Center’s Ophthalmology Department treats each year. “Global ophthalmology is not a traditional subspecialty, but it’s one that is very close to the heart of Hadassah,” Prof. Jacob Pe’er, immediate past Director of the Ophthalmology Department, told the hundreds of participants from 17 countries who attended the June International Ophthalmology Scientific Conference, hosted by Hadassah in commemoration of its centennial. 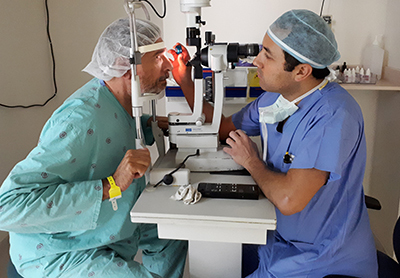 Hadassah’s leadership in world eye health includes six decades on the ground in developing countries and 100 years working with its Arab neighbors. Read the full story in the two Hadassah Magazine articles below.